Chocolate | "It's Not Wine, it's Mommy Juice!" I know even less about chocolate than I do about wine. But I know what I like. 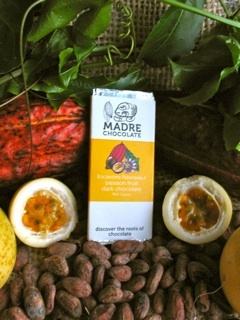 And my current favorite is Madre Chocolate, right here out of Hawaii. The two guys who run this operation are dedicated, knowledgeable, and good-looking! David Elliott is the Chocolate Production Manager and Nat Bletter is the Chocolate Flavormeister. I don’t know if that’s an official designation in the world of chocolate, but I don’t care. I want to be a flavormeister. And I want to be one now. 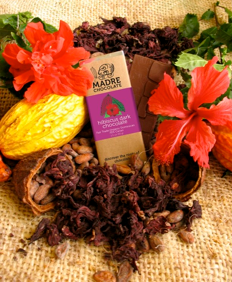 Candied Hibiscus - organic, fair trade, vegan, soy-free, yada-yada-yada… edible flowers INSIDE the chocolate bar…. buy it. Hawaiian Passion Fruit 70% Dark Chocolate - Passion Fruit is called lilikoi in Hawaii and it’s amazing. After you buy the Hibiscus bar, buy this one. You won’t be sorry. 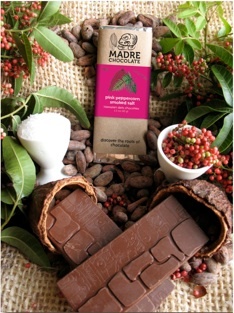 Pink Peppercorn & Smoked Salt - Hawaiian grown peppercorn, Hawaii sea salt, and Hawaiian dark chocolate. I just drooled on my keyboard. After you buy the Hibiscus bar and the Passion Fruit bar, buy two of these. Buy ten.